I decided to start a new series on The Beauty of Life: Throwback Thursday! I am super into #TBT on Instagram (be sure to follow me here), and I realized -- why not bring the same enthusiasm I have for the day over there to this space, too? Every Thursday, I'll be bringing you a little throwback from the past, whether it be a favorite product, a photo that represents how much I love fashion and beauty, an advertisement that really struck me, or even just a quote that's carried me through the years. And I'm starting the series off by talking about my very first lipstick. When I was about 4 years old, my mom let me start playing with her makeup. I was fascinated by all of the products, the colors, the application ... but mainly by this one fabulous lipstick. It was a shimmery orange-coral that came in a ridged green tube. When my mom said I could HAVE it, I was thrilled. I carried this lipstick with me EVERYWHERE -- it just made me feel so sophisticated and grown up. Now, here's the kicker. I CAN'T FIND A PICTURE OF IT ANYWHERE. I've searched far and wide to no avail! 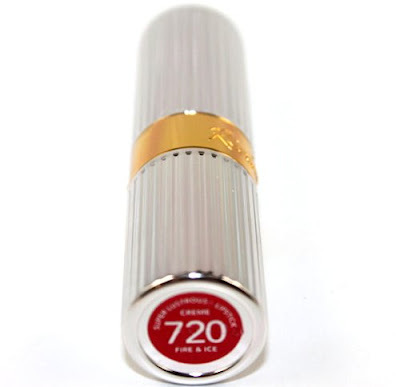 I think the lipstick was by Revlon -- very similar to the tube shown above, but it was a dusty green instead of silver. But I do know one thing. This lipstick was part of what started my obsession with beauty. And even if I can't remember who it was by or what the shade was called, it's still a product that stuck with me all these years. What's the first beauty product you tried and absolutely loved? Let me know in the comments!